MARTIN, Tenn. – The University of Tennessee at Martin’s League of Striving Artists will host the fifth-annual Holiday Art Bazaar, Dec. 6-8, in the Fine Arts Building’s art gallery. This event is open to the public from 7-8 p.m., Dec. 6; 11 a.m.-7 p.m., Dec. 7; and 10 a.m.-4 p.m., Dec. 8. Co-sponsored by the UT Martin League of Striving Artists and the Department of Visual and Theatre Arts, the Holiday Art Bazaar displays items handcrafted by UT Martin students, faculty and alumni. These items, which include holiday cards, paintings, scarves, ceramics, glass ornaments and more, will be available for purchase during the event. Guests may purchase items with cash, check or charge to support local artists. “Support the Arts” contributors will have early access to an exclusive opening reception from 5-7 p.m., Dec. 6. For information on how to become a “Support the Arts” contributor, visit utm.edu/starts or contact the UT Martin Department of Visual and Theatre Arts at 731-881-7400. The League of Striving Artists is an organization for UT Martin art students who strive to promote an appreciation for art and artist development through academics, service learning, community service projects and leadership both on campus and in the community. The art gallery is in room 201 of the UT Martin Fine Arts Building, located at 16 Mt. Pelia Road in Martin. For more information, contact Jason Stout, UT Martin assistant professor of art and faculty adviser for the League of Striving Artists, at 731-881-3402 or email jstout@utm.edu. 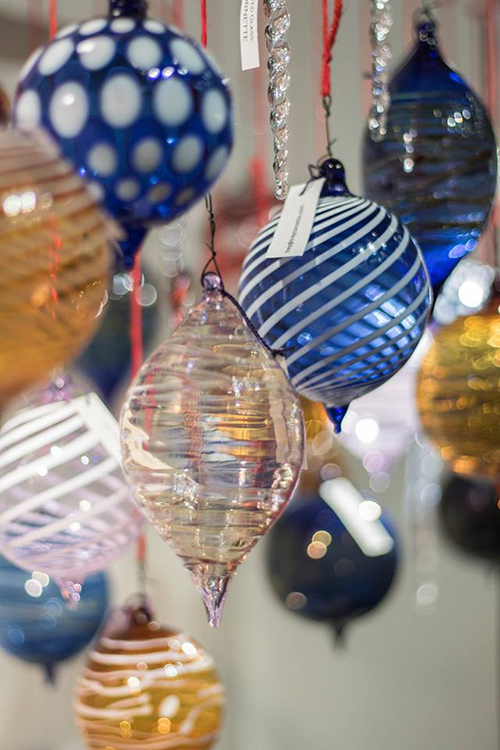 PHOTO ID: These hand-blown glass ornaments, made by a local artisan, are a feature at the League of Striving Artists' Holiday Art Bazaar each year.